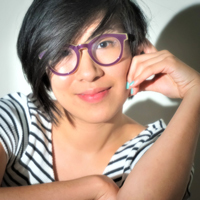 MYRA SU is a narrative artist specializing in storytelling through puppetry. Her primary medium is shadow puppetry, but her work also includes experimentations with crankies, paper craft, bunraku, video, animation, and taxidermy. Most recently, she was a featured artist at the 2018 National Puppet Slam in Atlanta, GA. Upcoming projects include a collaboration with renowned musician/filmmaker Tatsu Aoki (with assistance from the NPN/VAN Creation & Development Fund), and a new piece for the 2019 Baltimore Crankie Festival. She has worked with Manual Cinema since 2013 as a performer and puppet maker. She is ever grateful to be part of such beautiful and ambitious work—work that inspired her to pursue puppetry in the first place. For her portfolio, visit myrasu.com.